Recently, I was engaged in a Facebook argument (mature I know) with someone about whether or not Crohn’s disease could be cured. She (who doesn’t have the disease) was claiming that it could be cured by eliminating trigger foods from the patient’s died. I was trying to explain to her, with little success, that yes, if you eliminate trigger foods, some patients will experience a decrease in symptoms and subsequently may enter into a period of remission; however, that does not mean they are cured. Crohn’s disease and ulcerative colitis are the two main diseases that make up the broad inflammatory bowel disease diagnosis. In patients with these diseases, the body’s immune system attacks parts of the digestive tract and causes inflammation, cramping, diarrhea, bleeding and all sorts of other issues. Medications, surgery, and diet modifications can help patients with inflammatory bowel diseases live regular lives. In patients with Crohn’s disease, neither of these treatments induces a cure; the best they do is bring a patient into a symptom-free state (remission, see below). Patients with ulcerative colitis can be treated with the surgical removal of the colon; however, surgery will not cure the underlying inflammatory disorder that the patients have, leaving them susceptible to pouchitis, arthritis, skin ulcers and other autoimmune diseases. The bottom line: When you have an inflammatory bowel disease, you have it for life. Please take a look at the full piece here! These diseases have been known primarily as “pooping diseases” because many patients frequent the bathroom as a result of the cramping and abdominal pain caused by IBD. However, there are many aspects of the disease that are far worse than spending time in the bathroom. IBD patients often take many medications with powerful side effects. Patients with IBD often depend on medication to control the inflammation and pain caused by their disease. Medications commonly used include antibiotics, anti-inflammatories, steroids and immunosuppressants. While beneficial, these medications can cause side effects including nausea, vomiting, heartburn, night sweats, insomnia, hyperactivity, high blood pressure and stunted growth in children. Patients on immunosuppressants are at risk of developing lymphoma, tuberculosis, kidney and liver damage, anaphylaxis, seizures, and serious or fatal infections. Crohn’s disease and ulcerative colitis can cause issues in other parts of the body, including inflammation of the inner part of the eye, mouth sores, arthritis, osteoporosis, gallstones, kidney stones, skin rashes and ulcerations, blood clots, anemia and several neurological conditions, including seizures, stroke, myopathy, headaches and depression. IBD can have significant impact on the mental health of patients. According to Oak Park Behavioral Medicine, about 25 percent of people with IBD will experience depression even when in remission, and that number rises to 60 percent during a flare. Outside of depression, the Crohn’s and Colitis Foundation of America reports that patients with IBD often experience anxiety, denial, dependence, stress and poor self-image. Having IBD is exorbitantly expensive. The annual direct cost of Crohn’s disease and ulcerative colitis in the United States is estimated to be $6.1 billion. A recent study showed that the mean annual cost for a patient with Crohn’s was $8,265 and for ulcerative colitis was $5,066. Each patient’s situation differs, but the most common costs of IBD include diagnostic tests, hospitalizations, surgery and medications, some of which can cost as much as $10,000 per dose. You can view the full piece here. When I left my last job, I thought I was going to immediately start on the insurance plan at my current job. Unfortunately I was wrong- there was a month in which I needed to wait before I could become part of my company’s insurance plan. For many people, this wouldn’t be an issue- just go without insurance for a month and then start on the new plan on the first of the next month. However, when you have an autoimmune disease, you shouldn’t have a lapse in insurance- you never know when something is going to happen where you will need your insurance. For Dan and I, there was a whole other reason for needing to have insurance during that month- Remicade. Remicade is administered once every 6-8 weeks to people with moderate to severe Crohn’s disease and ulcerative colitis. Dan has been on Remicade since August 2010 and it has been his miracle drug. He goes every six weeks for a two hour Remicade infusion and that’s it for his medication. Since Remicade is a miracle drug, it has a hefty price tag associated with it- as much as $10,000 per infusion without insurance. I left my last job on May 24 and the insurance from that job expired on May 31. Dan was scheduled to get his Remicade infusion mid-June and, while you can push it back a few days, we couldn’t push it back two weeks until we started on my new insurance. And lord knows, we can’t afford the cost of the drug without insurance. 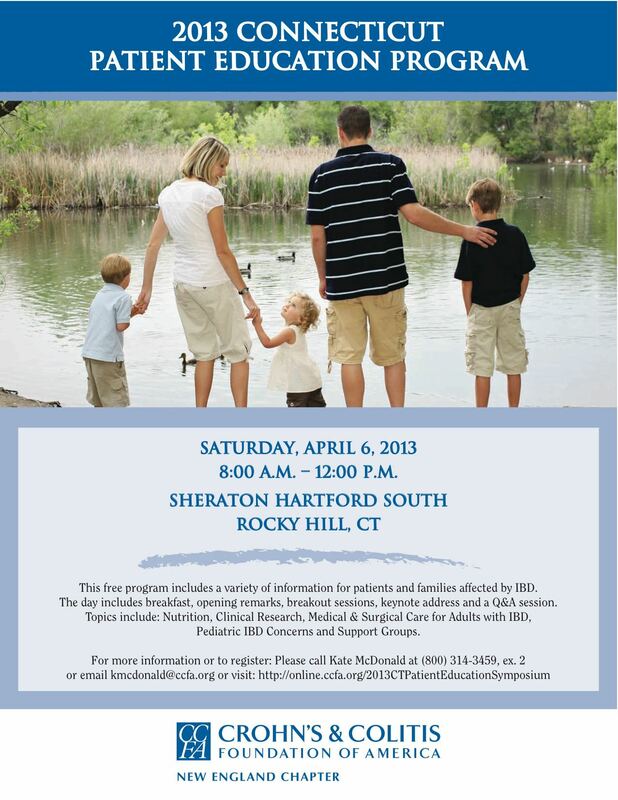 Attention Tri-State IBD-ers: Great Education Program in CT This Weekend! This is going to be a fantastic education event! Speakers include Dr. Jack Chuong (Digestive Disease Associates), Dr. Dinesh Pashankar (Yale Medical Group), Dr. Francisco Sylvester (CT Children’s Medical Center), Dr. Sandra Escalera, Dr. Joel Garsten (Digestive Disease Center of CT), Dr. Harry Schwartz, Dr. Phil Ginsburg (Gastroenterology Center of CT), Dr. Yanni Oikonomou (Yale Medical Group) and Dr. Michelle Smedley (Connecticut GI). Topics to be covered include IBD in children, nutrition, medical & surgical care for adults, novel therapies, and support groups. And the best part of it all- it’s free! Make sure to RSVP and check it out if you are around this weekend in CT. I happen to live in a state that recently legalized medical marijuana, so this post has been on my mind for awhile. Medical marijuana is a controversial topic- some people are extremely in favor of the use of the drug to help treat nausea, vomiting, and pain. This post is neither to promote the use of medical marijuana nor prohibit it- its just one that looks into its efficacy as a possible treatment for IBD.